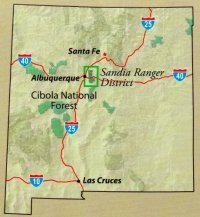 The Cibola National Forest map of the Sandia Ranger District contains the latest recreation and travel information to guide you through this area. The map is printed on waterproof, tear-resistant paper, contains shaded relief and is at a scale of 1 inch to the mile. On one side is the map itself, and the other contains photos, descriptions of the mountain ranges, closure information, trail profiles, as well as wind chill and climate variations. For more information, all the ranger district offices’ and related agencies’ numbers are easily found.